8. WHAT IS IT GOOD FOR? The format should be "macOS Extended (Journaled)", the Mac native filesystem. The image format should be "Sparse disk image". This indicates that the file itself will NOT be 4.7 GB in size, and will only grow as necessary. Choose Encryption if you want to password-protect your data inside and prevent unauthorized access to your files. Encrypting your data will convert the data into unreadable code. Note: This password can be added to your keychain. 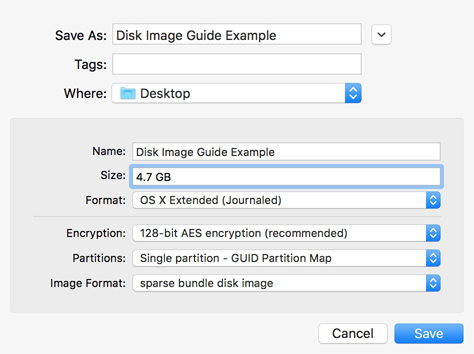 Disk Utility should have mounted the disk image automatically after creating it. A new volume with the name you specified should appear on the desktop. If not, simply locate the disk image file you just created and double click its icon in the Finder. Launch ChronoSync and specify your targets as you would normally do. In this example, we are creating a unidirectional sync with the source (left) target being the users "Documents" folder, and the destination (right) target being the newly created disk image. Depending on the nature of your backup, you may not need or want to modify any of the mounting options. In this case, we will instruct ChronoSync NOT to prompt for insertion, and to "eject" the disk image when synchronization is complete. The "Prompt to insert media" option is disabled because we don't want to be asked to insert the media if it is not mounted. ChronoSync will attempt to automatically mount the DMG before prompting for insertion so, if that fails, the DMG simply isn't available. 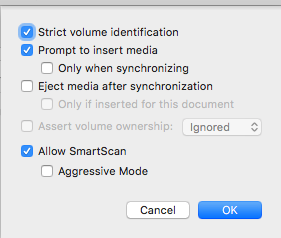 The "Eject media after synchronization" option is turned on because we will only be using this media for backup. When backup is complete, we want to immediately unmount it. This will prevent the user from "tinkering" with the contents of the disk image. In a shared environment, this will also allow the DMG to be mounted by another user. If the DMG is not mounted when synchronization begins, ChronoSync will attempt to mount it. Assuming this happens successfully, the mounted volume will appear on the desktop and synchronization will proceed as normal. When complete, the disk image will be ejected and the mounted volume will disappear from the desktop. Synchronizing to Windows or Linux file servers which do not support the HFS+ file system. This allows you to preserve all file attributes, including Mac-style filenames such as "Research ƒ".